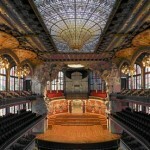 Palau de la Música Catalana (Palace of Catalan Music) is said to be one of the most beautiful concert venues on the earth. It was built in the start of the 20th century, and today it is together with the Hospital de Sant Pau on the World Heritage List of UNESCO. Therefore you should make sure to visit Palau de la Música while in Barcelona, and the best way to do so is to check out a concert there with one of your favorite artists.